Attention Dancers!! Tired, aching feet and legs? Knees hurting? I dance four to six nights every week in heels. Afterwards, I always bounce for a few minutes to get the kinks out and get the circulation going through my legs. I also jump a little, side to side, to strengthen the cartilage in the knees. I drink water between dances (at least 10 glasses/day). I jump and bounce on the rebounder (similar to a mini-trampoline) two to five times/day. Frequent, even short, stints on the rebounder dynamically boost circulation and metabolism like no other exercise, because weight-training and cardio-vascular exercises are combined simply and safely. FITNESS, WEIGHT LOSS: Maybe you've been dancing for years, but you're not as trim as you used to be (After all, the refreshments are delicious). Every time you're on the rebounder, you automatically work the midsection and burn calories more efficiently than in any other exercise. For example, rebounding is 68% more effective than jogging and absorbs 87% of its impact (NASA Study), so you will not injure nor wear out your joints. In fact, joints are strengthened as the cells are forced to adjust to the varying gravitational pull during the up and down motion. When I first started rebounding, I lost eight pounds within two months, without dieting. Rebounding keeps the weight off, even after a large meal, and actually aids digestion. I recently sold a rebounder to a 72 year-old woman. Her dressmaker kept taking in her skirts, as she became the incredible shrinking woman. STAMINA: Do you get winded/out of breath, when dancing a fast Milonga, Salsa, or Viennese Waltz? Increase your lung capacity by rebounding! Yes! When I was in Junior High School, I couldn't run around the block. I couldn't even run to the corner! But, I played intramural basketball (half-court), guarding the school's 5'10" star center. I was breathless, but I made her useless, until I paused to take a breath. The ball was passed, and her team beat mine, 4-2, just because I was momentarily out of breath. Fast forward to 2001: A 19-year-old woman challenged me to 1 on 1 basketball. I was on her like white on rice! She finally said, "Let's play something else! " Take up rebounding, and you won't have to stop dancing fast. BALANCE: Balance is so important in dance. I've improved mine tremendously on the rebounder. I can jump around in a circle, on one leg, with my eyes closed! This ability really helps me, when I need to hold a position in dance, or when I am twirled around several times. STRENGTH: My former boyfriend (6'3", 180 lbs.) had put my arm down, instantaneously, when we arm-wrestled. Within 2 months of rebounding, I felt that my arms seemed stronger (strangers at a dance commented on my arm definition). So, I suggested we arm-wrestle again. I figured he'd have more difficulty putting my arm down. Well, after some struggle, I put his arm down! We were so stunned that we wrestled again, and I put his arm down, again! Then, he started rebounding, and his masseuse said, "I know you've been working out for 2 years. What have you been doing the past week?" She actually felt the difference in all the muscles, throughout his body. How has rebounding improved my dancing? It's given me tremendous energy, stamina, balance, and strength. It's toned and tightened me. How can rebounding improve your dancing? The same way! Put on some music, and dance on the rebounder, or do specific targeted routines with small hand weights, for a few minutes, a few times/day - for the safest, fastest, most efficient, portable, most convenient, easiest, most reasonably priced workout of your life - and get into the best shape of your life! 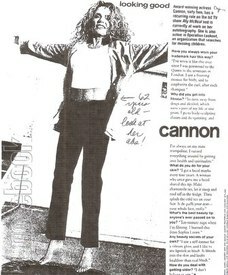 Dyan Cannon from Ally McBeal, rebounding on a mini-trampoline.